In the fiberglass-centric world of recreational boating, it’s easy to forget that some of the finest yachts are built of welded aluminum. 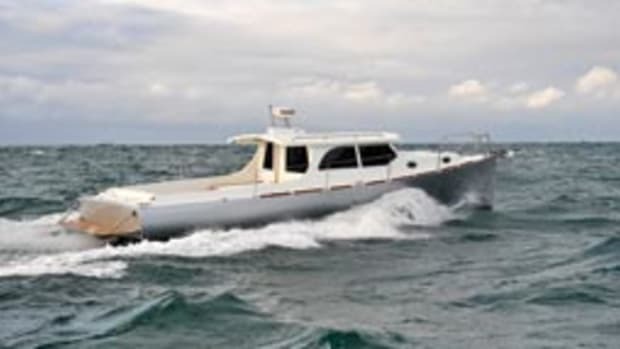 So are many commercial small craft — below 100 feet — in operation today, as well as ships to more than 300 feet, where reducing weight to achieve high speeds is very important. First, a science lesson. Manufactured from the ore bauxite, aluminum is a silvery-white, ductile metal with excellent corrosion resistance, strength and toughness. It can be easily cast and welded, melts at 1,220 F (as opposed to 500 F for fiberglass), and weighs 170 pounds per cubic foot — a little more than a third as much as steel. Aluminum’s strength varies depending on the alloy, but marine-grade 5083 H-32 aluminum plate starts to deform at 34,000 psi and fails at 45,000 psi. What this means for the boat owner who runs aground at 25 knots is that the metal stretches and dents before it ruptures, which is good when the goal is keeping the ocean outside the boat. In fact, aluminum’s ductility lets it deform, or stretch, some 25 percent before it fails, and this “plastic region” is one of the characteristics that make it so suitable for boatbuilding. The plating surrounding aluminum welds is about 60 percent as strong as the surrounding members it joins. In order to compensate, backing plates and longitudinal stiffeners help spread out loads, and hull plates are butted in between, rather than at the frames, to minimize stress at these structural hard spots. Isn’t it great to know you can run your aluminum boat right up on your favorite shingle beach without worrying about scratching the gelcoat? And you will likely have a much better chance of maintaining watertight integrity after a hard grounding than with the average fiberglass boat. In addition to strength, toughness and abrasion resistance, another reason aluminum is used in so many commercial and military vessels is its low maintenance. Above the waterline it doesn’t even require painting, since a corrosion-resistant film of aluminum oxide forms on the untreated surface. 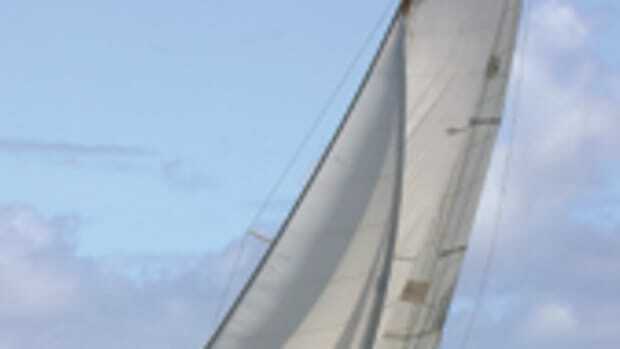 This ability to bare all includes the bilges, which are usually left unpainted. I know others see it differently, but to my eye unpainted aluminum is about as attractive as troweled concrete — pretty it’s not. Still, it’s nice to know how inherently corrosion-resistant aluminum is. And forget about scraping and painting, or compounding and waxing gelcoat. As an aside, don’t let this lull you into a false sense of security about aluminum fuel tanks. Aluminum will corrode if water collects against a poorly installed tank, one where the water has nowhere to drain and deoxygenates. That’s why it’s so important that aluminum fuel tanks are installed so air can circulate around the outside of them. It’s also why you should avoid a foamed-in aluminum tank. Foam can trap water, you can’t see corrosion developing until it’s too late, and the foam makes it much more difficult to remove the tank come replacement time. Since an aluminum tank will have to be replaced someday, a boat with a deck hatch to help with its removal and replacement will save you money and aggravation when the time comes. But I digress. Aluminum isn’t as abrasion-resistant as steel, but it’s lighter and tougher — and by far more abrasion-resistant — than fiberglass or wood. And just by using more of it, aluminum can produce a vessel that’s stronger than steel at less weight. As with any material, it costs more to build an aluminum boat that’s light and strong. Anyone can build one that’s light and weak. When comparing aluminum boats, ask about plate thickness, especially in the hull bottom and sides. (The bottom is often one size thicker, for obvious reasons.) Also, look at the spacing and scantling (size) of the hull and deck framing. Deeper frames are stiffer, all else being equal, but they also take up more interior volume. The kind of welded aluminum boats we’re discussing here are not to be confused with riveted or welded jonboats and pontoon boats. Pontoon boats are typically made of .080-inch aluminum stock that comes on a roll and is cut into the required lengths with giant shears. 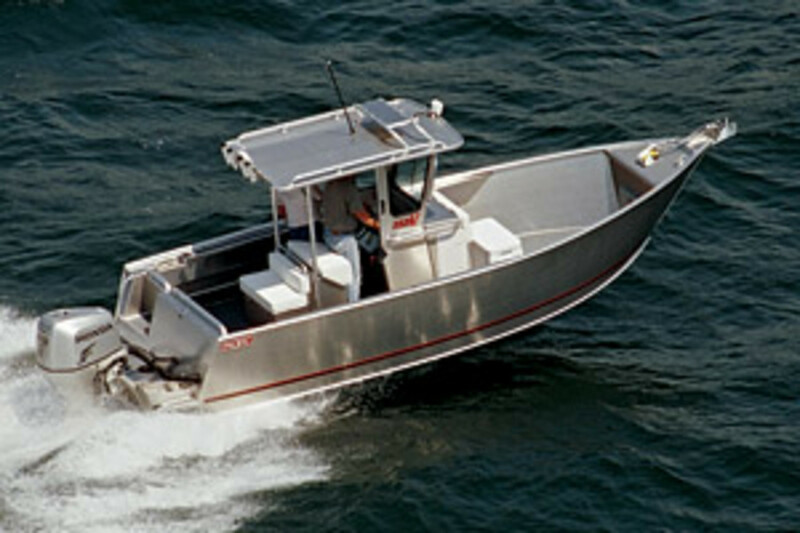 Aluminum and walleye fishing boats in the 16- to 20-foot range might have .090- to .125-inch “sheet” aluminum hulls, the same thickness range and aluminum grade — 5052 — as most aluminum fuel tanks. The plate aluminum boats we’re focusing on in the 20- to- 40-foot range might have hull plating from 3/16 to 1/4 inch thick — about twice as thick as the smaller boats just mentioned. Perrotta is trying hard to bring aluminum boats (he calls them “alloy” boats) into the mainstream. “A lot of people have misconceptions, but I try to put our boats in perspective for them and say what they’re looking at is not a jonboat on steroids, but rather a yacht made small,” says Perrotta, whose company (www.rocksaltboats.homestead.com) can build from 15 to 100 feet, inboard, outboard, sterndrive or waterjet. Rock Salt produces a 34-foot deep-vee available as a semiproduction model that can be customized according to the customer’s needs. 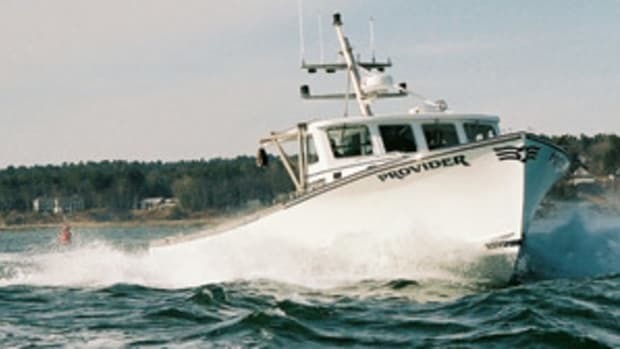 “The next 34 will have a pair of 315-hp Yanmar diesels with Yanmar sterndrives for charter use in Florida running 100 miles offshore daily to fish,” he says. 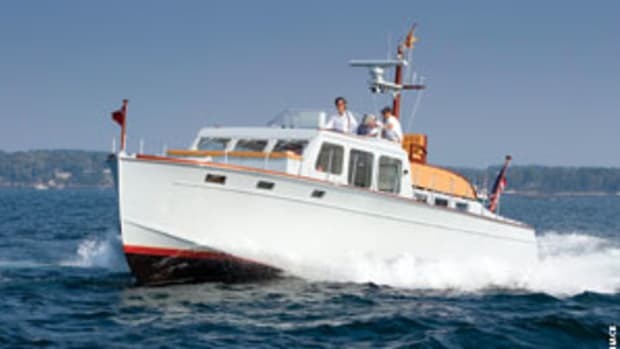 Perrotta also owns Black Lab Marine (www.black labmarine.com), the 12-year-old East Coast representative for Seattle-based Pacific Boats. Black Lab finishes off Pacific’s welded aluminum hulls and has sold about 400 boats in 10-plus years — 23- and 26-foot center consoles ranging in price from $50,000 to $120,000 with power. Among those also building quality aluminum boats are Coastal Craft, Maxweld Boats, EagleCraft and others, according to Perrotta. While the true condition of a composite fiberglass boat can remain a mystery even to a competent surveyor, absent destructive testing, an aluminum boat bares all its secrets. 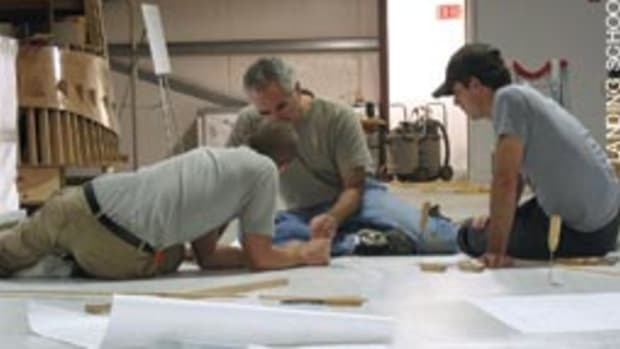 With aluminum there is no core to rot or delaminate, no fiberglass voids to blister, no faulty skin-to-core bonds, no rotted plywood transoms, no soft stringers or bulkheads around poorly sealed limberholes. What you can see with an aluminum boat is pretty much what you get. And aluminum welds can be X-rayed. Hull-to-deck joints are welded, so there are no rivets and fasteners to come loose and leak. These are truly one-piece vessels. Dent the hull or deck badly enough, and you just cut the abused section out with a carbide saw and weld in another. There’s no gelcoat to match, no core to worry about compressing with a through-hull fitting, no scarf ratios. Pulpits, cleats, chocks and towing bitts can be welded right to the deck, assuming they’re adequately backed up. It’s common to fit diesel-powered aluminum boats and ships (big ones, anyway) with integral tanks. The bottom of the hull is also the bottom of the tank, and the tank becomes part of the hull structure. This eliminates wasted space between a separate tank and the hull, maximizing tank capacity and lowering the center of gravity of the fuel. Gasoline-powered boats, however, require separate, non-integral fuel tanks, since the consequences of a leak in one of these tanks could be a lot more memorable for anyone in the vicinity. While an aluminum boat is invariably more expensive to build than a fiberglass equivalent built from a reusable mold, a quality aluminum boat might hold its value better over time. Why? Three reasons: Their true physical condition, in large measure, can be ascertained with a high level of certainty; they stand up to abuse so well; and cosmetics don’t drive value as much as other factors. For most do-it-yourself boatbuilders, buying a fiberglass hull and deck and finishing off the boat is going to be the easiest (though it is by no means easy) way to go. But if you’re a little more adventurous, like to weld, and prefer the aroma of vaporized aluminum MIG welding sticks to styrene, fiberglass and resin, you can buy an aluminum kit boat. At its most basic, this means you buy Mylar templates that are used to mark the plating so you know where to cut frames and plating. You can even cut aluminum with basic power tools and metal-cutting blades. Keep in mind we’re talking about aluminum plating that’s 3/16 inch or more thick, not sheet aluminum. A better way to go, from a precision-fit and ease-of-building perspective, is to buy a kit with all the aluminum pieces precut. You just set them all up on jigs and weld them together. This is not a bad way to go if you have the metal-working skills — or the time to acquire them — and you want to minimize cost. Keep in mind that a fiberglass kit hull and deck are laid up in a mold, so they are (or should be) smooth and shiny on the outside. Obtaining the same finish in an aluminum hull takes a lot of fairing and sanding, since the heat from welding distorts the metal. But if you leave the hull unpainted, this doesn’t really matter. Obviously, you can’t expect to learn how to weld aluminum overnight. And it would be a good idea to find an instructor and do many hours of practicing on scrap metal before you start piecing together a boat. And in the spirit of full disclosure, I wouldn’t leave the dock in a boat on which I did any of the welding below the waterline; I know my limitations. Fortunately, there are plenty of aluminum-boat builders out there. Stock production boats, custom boats and a mix of stock boats with custom touches are all available. 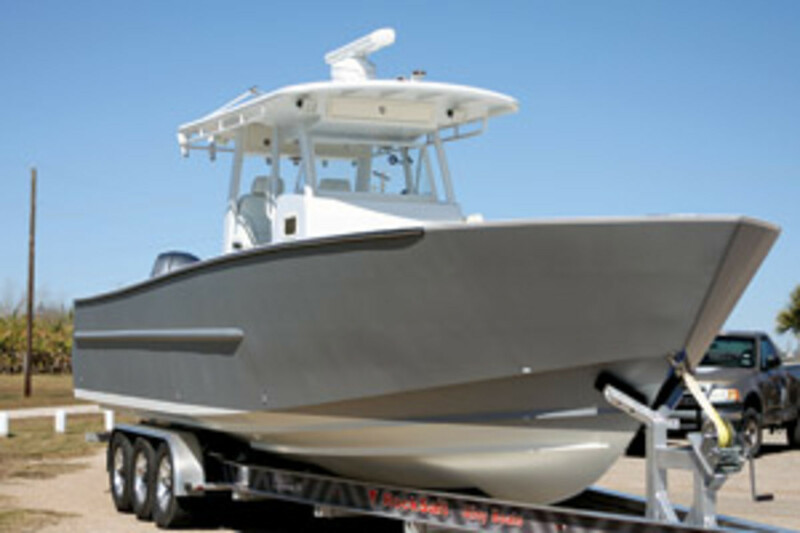 In fact, customizing an aluminum boat is easier than modifying a fiberglass model. You can weld pieces of aluminum in place and move non-structural bulkheads, seats and other components. With glass you must create molds and fuss around with endless filling and sanding. Is electrolysis a significant concern with aluminum boats? A limitation regarding plate aluminum is that it can only twist in one direction, so anything built of it has what are called developable curves. This makes for a less attractive boat than a fiberglass hull with compound curves creating tumblehome aft and flare forward, and more curves where advantageous in the hull bottom to optimize the running surface. Of course, you can pay more and have the boat built of aluminum strakes, or planks oriented diagonally, which allows some compound shape to be built into the surface. This also requires a lot of fairing to get the surface smooth, but it can certainly be done. Most aluminum boats are built with a single chine for ease of construction — and because a single chine makes the most sense for a planing hull. Displacement vessels can be built with multiple chines that provide a more easily driven and seakindly hull form. My view is that, for a typical planing hull, you’re better off coming to terms with the material’s capabilities and limitations and opting for a flare-free bow. What are some of the downsides to aluminum? As I mentioned, it’s not so easy on the eyes in its unpainted state, and it has pretty close to zero thermal insulation value. It’s not good as an acoustic insulator, either, so wave impact noise comes through the hull and deck, as does machinery noise, without proper insulation. For this reason, insulating the hull and deck to control temperature, condensation and noise for all but the most utilitarian boats is a smart move. And you have to take precautions against electrolysis and crevice corrosion. If you’re looking for a custom — or highly customizable — boat that won’t blister, delaminate or rot, is easy to repair and maintain, is rugged and damage-resistant, that’s light and strong, and can stand up to decades of hard use, I suggest giving aluminum a close look. You might even be in the vanguard of a practicality-driven populist trend. 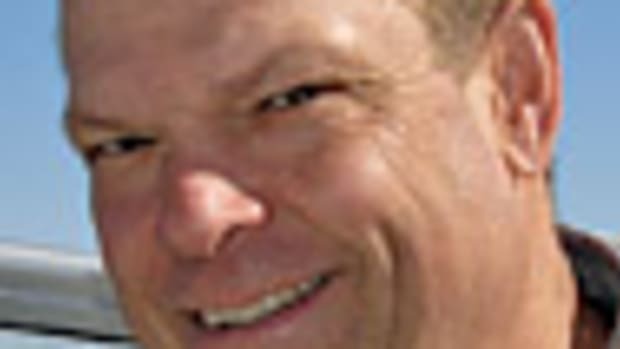 Eric Sorensen was founding director of the J.D. 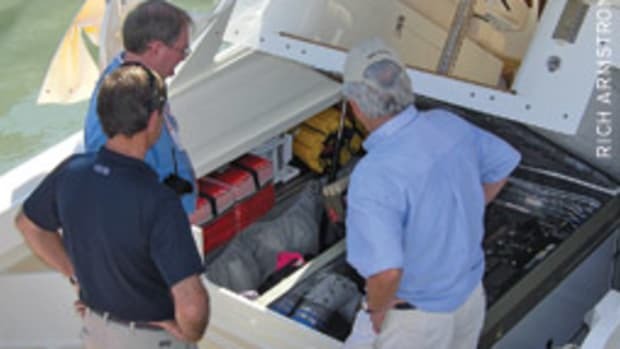 Power and Associates marine practice and is the author of “Sorensen’s Guide to Powerboats: How to Evaluate Design, Construction and Performance.” A longtime licensed captain, he can be reached at eric@sorensensguide.com. This article originally appeared in the May 2009 issue. Decision time: Will it be new or used? Is that repo boat really a bargain?